Watchable addiction drama anchored by an Oscar-nominated lead performance from Denzel Washington, though it never really tops its terrific opening half hour and it's at least twenty minutes too long. 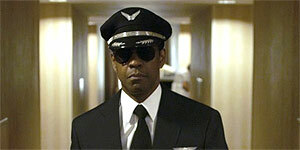 Directed by Robert Zemeckis (making a welcome return to live-action features with his first since Cast Away in 2000), Flight stars Denzel Washington as Whip Whitaker, an airline pilot who we first meet recovering in a hotel room after an all-night drugs-and-booze bender with a stewardess. After snorting a line of coke, he suits up and heads off to fly a plane from Orlando to Atlanta, so it's something of a miracle when the plane malfunctions and Whip manages to crash-land in a field after first flying the plane upside-down. Whip's quick thinking saves the lives of 96 of the 102 people on board, but he finds himself targeted by the investigation after a toxicology report reveals high levels of alcohol and cocaine in his blood. While his union rep (Bruce Greenwood) hires a high-powered lawyer (Don Cheadle) to defend him, Whip attempts to get clean with the help of an attractive fellow addict (Kelly Reilly as Nicole) he met while recovering in hospital. But first he has to admit that he has a problem in the first place. A shrewdly cast Washington is terrific as Whip, delivering a complex and challenging performance that constantly forces you to question your sympathies for his character, not least because he continues to indulge in lying and deception, rather than face up to his responsibilities. Reilly is engaging and achingly vulnerable as Nicole and there's strong support from the likes of John Goodman (stealing the entire movie with a three scene cameo as Whip's buddy/supplier) and Melissa Leo as the chief prosecutor. The opening half-hour of the film is utterly riveting, from the shock of seeing Whip snorting coke, sneaking vodkas from the flight attendants' supplies and then confidently taking off like it's business as usual to the terrifying flying-a-plane-upside-down sequence (Whip is basically the ultimate high-functioning alcoholic) and the nail-biting crash landing. Unfortunately, the film never really tops that opening thirty minutes. The main problem is that the pacing slows to a crawl after the exciting opening and the film is at least twenty minutes too long as a result. Similarly, the finale lacks dramatic impact, not least because the resolution isn't consistent with Whip's previous behaviour over the last two hours and therefore fails to ring true. Flight is an engaging and subtly provocative drama with a superb performance from Denzel Washington, though it's also twenty minutes too long and doesn't quite deliver the emotional pay-off you're hoping for.